This morning's weekly jobless claims, probably the best 'real time' indicator, have spiked over 480K two weeks in a row. There was a lot of noise in this figure in July as typical auto plant shutdowns for retooling did not happen this summer, but not we are past that point - hence no seasonal factors to be used as a crutch. Put another way, the Kool Aid crowd is running out of excuses. Remember, we need to be below 425,000 to have any reasonable chance at decent job growth... we have NEVER hit that level once during the (cough) "recovery". Initial jobless claims rose by 2,000 to 484,000 in the week ended Aug. 7, the highest level since mid February, Labor Department figures showed today in Washington. Economists forecast claims would fall to 465,000, according to the median of 42 projections in a Bloomberg News survey. The government revised the prior week’s claims figure up to 482,000 from a previously reported 479,000. The four-week moving average of claims climbed to 473,500 from 459,250. 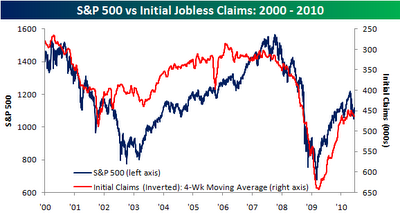 Remember this entry/chart from June [Jun 17, 2010: Weekly Jobless Claims as Stock Market Indicator] on the correlation between the direction of weekly jobless claims and the direction of the S&P 500. After the data this morning, gold spiked ... which I believe is the market saying, the due date for Ben's next round of Quantitative Easing has been moved up. I'll be buying some downside index hedges on the open as we clearly will be below S&P 1086, and use that as the pivot point. With the sharp sell off back to back, a snap back rally will surely come but unless 1086 can be regained on a closing basis, we are back to an environment where the rallies are to be sold/shorted. I'll be looking to sell down some long exposure as well, although happily we locked down some gains the past week when bad news = good news because it meant more free money. Now we are back to bad news = ugh. Key today will be to see if dip buyers show up in the morning as they have for much of the past 6 weeks (excluding yesterday). Ironically, this increase in job losses is "good" for corporate profits (less humans = more profits) but some days the macro environment will supersede the reality that slashing and burning American workers is a boon to S&P 500 profits.